HeidelbergCement AG (Germany), the second largest global cement producer, is selling its assets in Ukraine, several sources on the market have told Interfax-Ukraine. "HeidelbergCement is selling its assets in Ukraine. The deal is to be held in March-April of this year. The buyer will be the Ukrainian investment group Concorde Capital," the agency's source said. PrJSC HeidelbergCement Ukraine (Dnipro), which unites the Ukrainian cement plants of HeidelbergCement, refused to officially comment on the deal for Interfax-Ukraine agency. It was also not possible to get a comment at the head office of HeidelbergCement and Concorde Capital. The company has been operating in Ukraine since 2001 and owns three cement plants in Ukraine: Kryvy Rih, Kamiansky and Amvrosiyevsky. 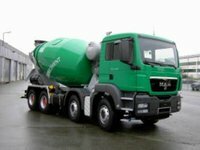 HeidelbergCement is one of the world's largest building materials companies, the number one in aggregates production, number two in cement, and number three in ready-mixed concrete. The company operates in 60 countries, has 616 production sites for sand, gravel and rubble, 159 cement and grinding plants, 1,700 concrete plants and 112 asphalt plants. PrJSC HeidelbergCement Ukraine saw a 14.4% rise in net loss in 2017, reaching UAH 431 million.